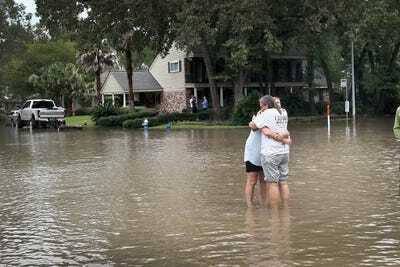 Getty ImagesFriends reunite in the middle of a flooded intersection as water continues to rise in their neighbourhood following Hurricane Harvey on August 30, 2017 in Houston, Texas. 69% of Republicans said the threat of climate change is “exaggerated” compared to 4% of Democrats, according to a new Gallup poll. Opinions around climate change have suffered from widening partisanship as President Donald Trump’s administration has scrubbed mentions from federal websites and pulled out of the Paris Agreement. The problem isn’t going anywhere, despite what people think. Republicans are more sceptical than ever that climate change is a problem, and the partisan gap on the issue appears to be widening under President Donald Trump. Sixty-nine per cent of Republicans say the threat of climate change is “exaggerated,” according to a new Gallup poll. While the poll indicates the majority of Americans agree with the scientific consensus and are concerned about climate change, Republicans are less convinced – even compared to last year. Some 18% of Republicans said they believe that climate change wouldn’t pose a threat to them in their lifetimes, up from 14% in 2017. While the majority of Republicans don’t think climate change is a problem, Republicans in swing states are supportive of renewable energy policies, according to a poll from Greenberg Quinlan Rosner Research conducted in conjunction with the Sierra Club. In both Ohio and Pennsylvania, the majority of Republicans support the goal of transitioning to 100% renewable energy, and voters from both parties say they are more likely to back candidates who support renewable energy. In any case, the problem of climate change isn’t going away. Last year was the second warmest year on record, behind only 2016, and all five of the hottest recorded years have occurred since 2010, according to NASA data. The US also spent more money on weather-related disasters in 2017 than any year before – $US306 billion, according to a NOAA study – due to an extremely active hurricane season, and a series of devastating wildfires in California.